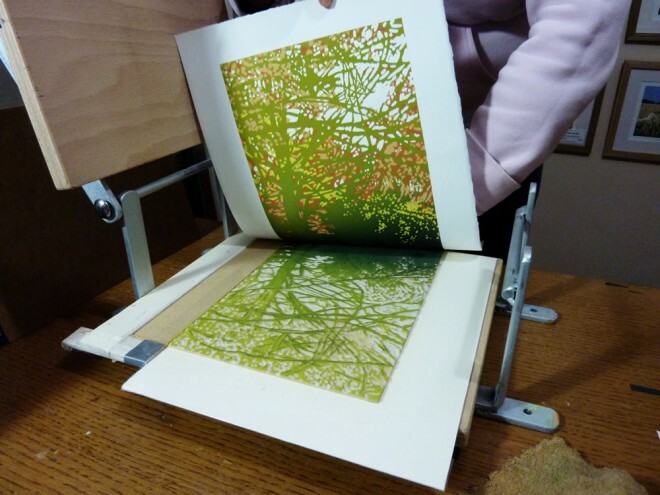 Alexandra Buckle is a master at the reduction linocut – the process of creating a multiple colour linocut print from a single tile, by printing several layers over the top of one another in different colours at various stages of the cutting process (she explains more fully below!) Alexandra was a prize winner in our ‘Impressions of nature’ Printmaking competition in May, winning £50 worth of Jackson’s gift vouchers. 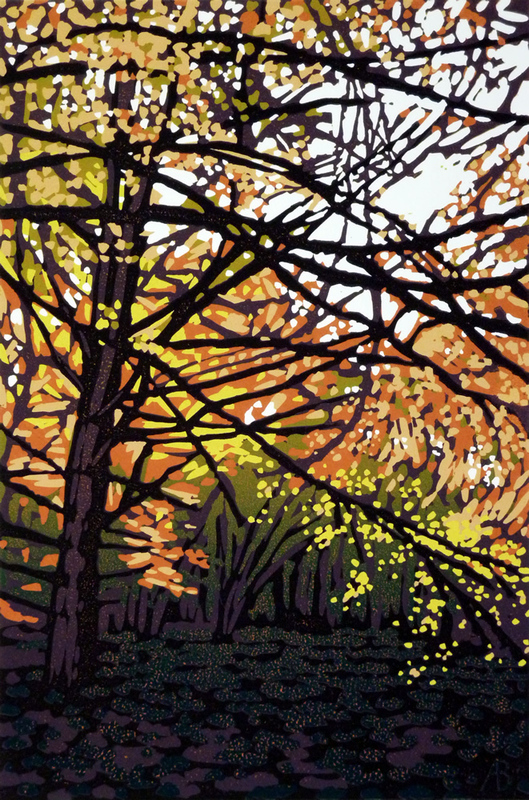 Her linocuts are just as inspired by the characteristics of digital and photographic imagery as they are by the traditional printmaking process she works with, and the timelessness of her woodland subject matter. Lisa: OK, so on your website you expressed a desire to invest in some new lino cutting tools. Which ones do you have your heart set on?! Alexandra: Well I’ve just purchased the Swiss Pfeil set C. I’d recently bought set B and was keen to get some more! I’d got by on cheap cutters for so long that I thought it was about time I treated myself. It was lovely to feel a bit less guilty about adding a few more to my collection by using the voucher towards them! Lisa: Can you explain what a reduction lino cut print is and how terrifying do you find working in this way? It’s not for the faint hearted is it…?! 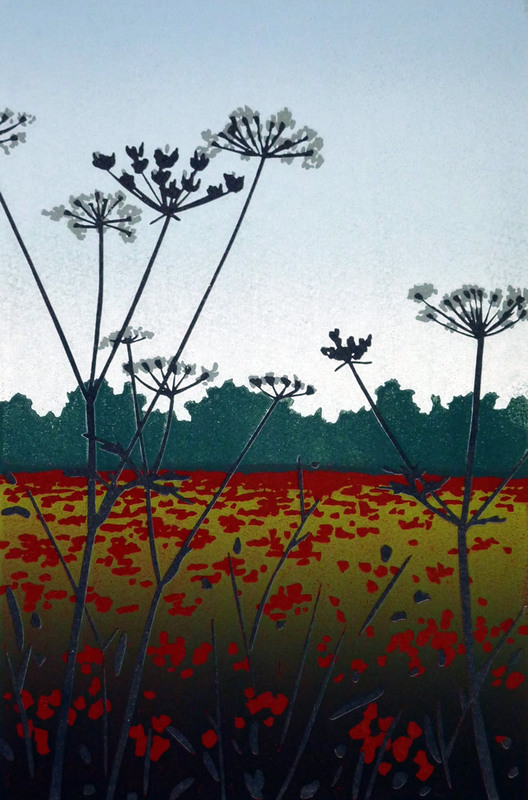 Alexandra: A reduction linocut is a multi-layered print that has all it’s layers cut and printed from the same block of lino. It involves working very methodically, mistakes cannot be rectified later as there is no going back to an earlier cut of the block and no opportunity to reprint more at a later stage. 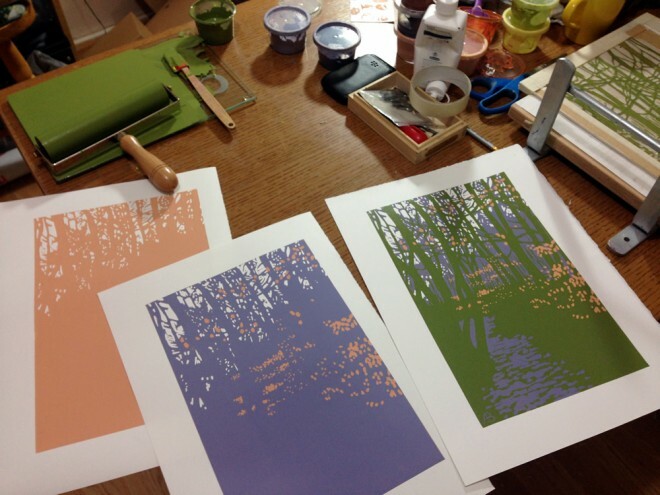 It can be very hard to judge how the print will look until the last colour is applied to the paper. You invest a lot of energy and work into it the piece before you know whether you will get the result that you were looking to achieve! The first few reduction linocuts I did, I found pretty nerve-racking, yes! To the point that I used to find it hard to sleep while I was mid-print – partly through worry about messing it up and partly through excitement of wanting to know how it was going to look! At that stage I was planning my prints down to the last detail too. Now I have done so many reductions that I’m far more relaxed about the whole process and I just start them and see how I get on! Lisa: How do you decide which colours you are going to use in your prints? Do you ever print different colour variations of the same design? Alexandra: I work from my own photos, so the colours are partly guided by the photo, but generally I find the photos are more helpful in guiding me with the tonal values. The colours are mainly guided from my memory of the scene with a little artistic license added in to create the correct mood! Sometimes once I start printing, the results start to dictate the colour choices and I have to readjust my plan! I normally use 5 or 6 colours in each print. The most I have ever used is 8, but I felt that the piece didn’t really benefit from having more colours. I don’t normally do different colour variations because it would involve a lot more paper, a lot more printing and a lot more clearing up! Lisa: Do you have a favourite print? Alexandra: My current favourite of my own work is Beech Leaves in Winter. It is quite a recent print. I’m really pleased with the choice of colours and the mood created. It would be easy to dismiss the winter months as not as interesting aesthetically but I find interesting colour in every season. I use a lot of purple in winter – I like purple! Lisa: How did you learn to print? Did you go to Art School? Alexandra: I did Art throughout School, Foundation Art at Oxford Brookes and Design: Crafts at Staffordshire University. The printmaking happened by accident really! I had a Dryad lino cutting kit when I was little which I used to enjoy using but I then dismissed printmaking for years until I did a workshop at Buckingham Art School in reduction lino and I was sold straight away! 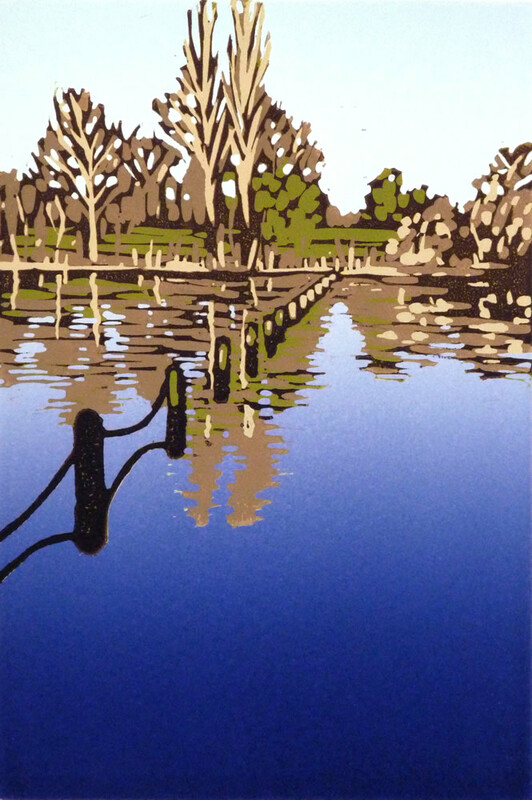 I’d only ever done single colour linocuts up to that point and had no idea about multi-coloured reduction prints. 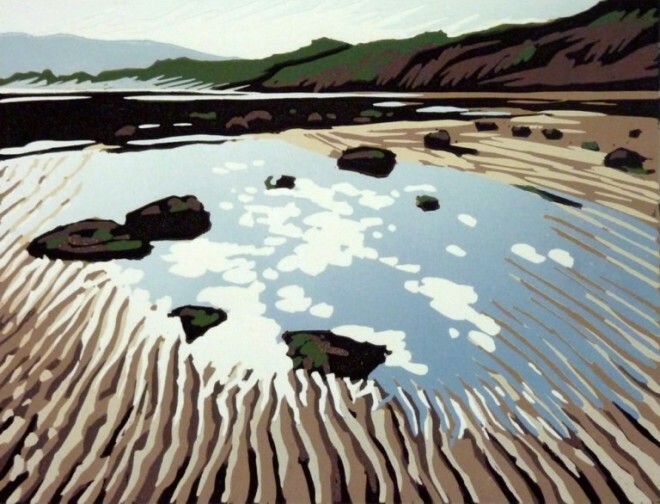 I’d always enjoyed painting, and my paintings were ok, but I feel that my linocuts very quickly began to turn out the way I used to want my paintings to look, which was very exciting for me! I think I was also drawn to the simplicity of relief printing – I liked that I could do it easily as home on my dining table! Print studios always intimidated me slightly! Lisa: You also teach printmaking. 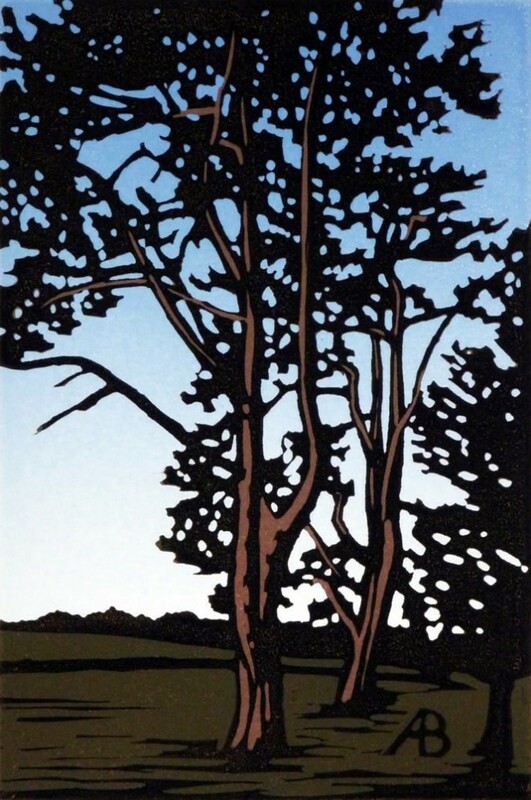 What aspects of linocut do you cover on one of your courses? Alexandra: People come to me very keen to try the reduction technique. They may have had a go at it themselves and need a little more guidance with a particular aspect of their work, perhaps they are not confident at the cutting or they need help inking up the plates successfully, or mostly, they need help working out what order to do everything! I also teach complete beginners who want to try something new. 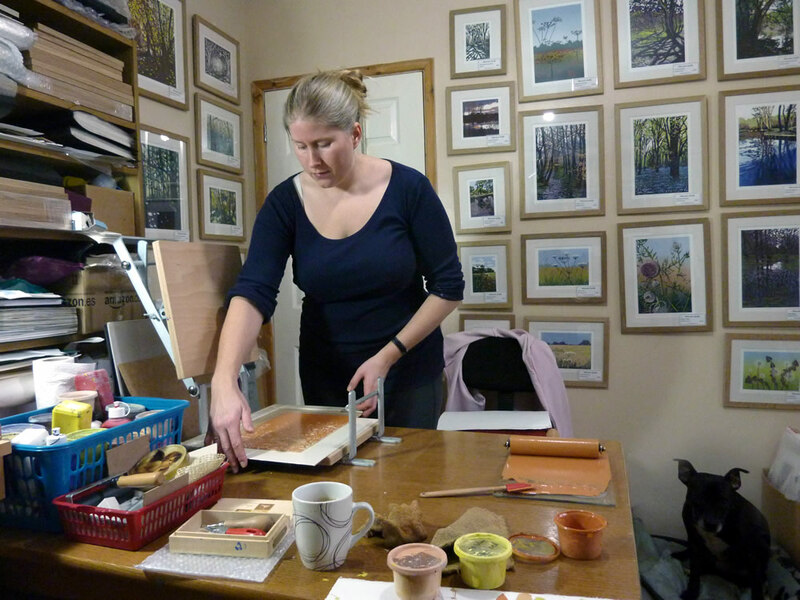 I offer regular 2 hour sessions which give people opportunity to learn the technique at a more gentle pace over a few sessions, or day workshops which are a more intense experience – I don’t like people to go home without a finished run of prints and it is hard work completing a reduction linocut in a day! I can accommodate a single student or I have space enough for two friends to come together. Lisa: How do you design the compositions for your prints? Is there a lot of drawing involved? Alexandra: I compose my prints as I’m taking my photos. I can normally tell straight away if a photo will make a good print. I now have hundreds of photos! – Mainly of woodlands! If only the printing process was as quick as taking a photo – I’d have hundreds of prints too! Sometimes, if I can’t quite get the composition I want within the photo, I combine images to suit my requirements. Only the bare bones of the layout is drawn onto the lino and then use the photo to guide my cutting. I like to think that the end result of the print looks slightly photographic rather than a more design or pattern based approach to lino cutting. Lisa: What are you working on at the moment? 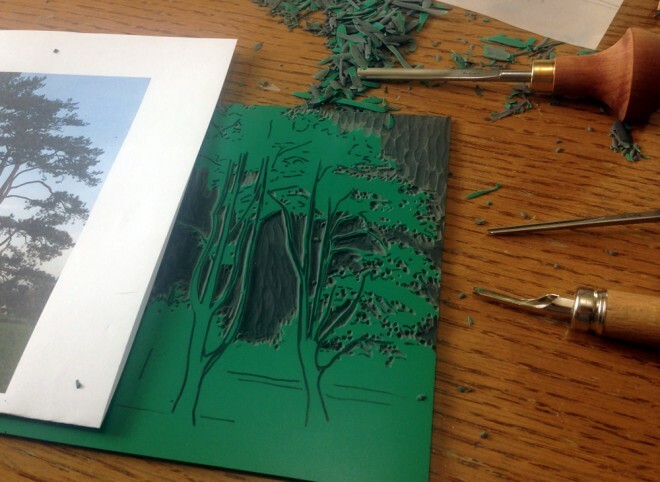 Alexandra: I’m currently working on a square print of some trees at dusk from some photos I took at Waddesdon Manor. So far I’ve printed a gradient for the sky and I’m currently cutting the sky from the block to reveal the trees and ground in the foreground. It’s a tricky cut as I want the trees to look sufficiently delicate. 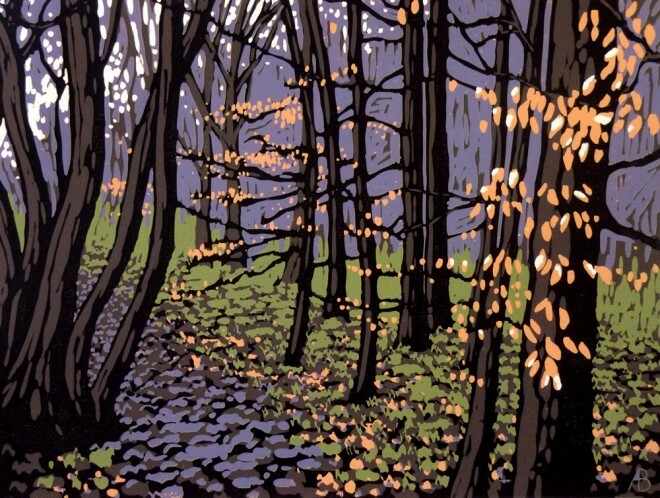 I’m hoping it will come out as well as a very similar print ‘Waddesdon Trees’. Alexandra: You may have seen 2 of my prints recently at the Society of Women Artists exhibition at the Mall Galleries in London, which took place at the beginning of June. I love the lino cuts,brings to mind the travel poster designs of the 30s and 40s,and the wonderful illustrative designs of Brian Cook.In a word,superb.